Ever experienced a leg cramp when sitting in a kayak and with the limited amount of legroom? With a closed style kayak there is unfortunately not a ton you can do. This is a common experience, feet and legs falling asleep with a cramped feeling. This doesn’t mean you should give up the sport all together especially when there is another option out there. Sit on top kayaks are a great way to combine the many benefits of a kayak with the amount of room you get in a canoe. Touring sit on top kayaks are often preferred as they will give you a lot of space for the movement you need. This type of kayak gives you all the space you get in a canoe with all the fun and convenience of a kayak. A favorite activity by so many, we found the top five on the market. This is the best sit on top kayak for beginners that will have you fishing out in the open water in no time. It sports a wide stable base with a spacious cockpit. You sit along the bottom of the hull while the walls come high around you all while your legs are completely exposed. Even with this feature it still has ample room for your belongings in its well thought out bungee system, dry storage and even rod holders. Coming equipped with a comfortable, adjustable seat and an anchor trolley system you will want to spend the whole day sitting in the middle of the lake enjoying the scenery. It also has a drain plug for any excess water you accumulate during your journey. The Kayak Frenzy kayak is the best sit on top recreational kayak. The molded foot rests ensure you will have enough room no matter how tall you are. A perfectly placed cup holder allows you to have quick access to your favorite beverage. The seat is comfortable and easy to install while the bungee storage system ensures your belongings stay securely on the deck. Being four way adjustable, this seat is great for long distance travel or for extended time spent in your kayak. A threaded drain plug will let the water drain freely as you coast along the water. A replaceable rear skid plate ensures you will not need to purchase another kayak any time soon no matter how hard you are on it. The handles allow you to carry it from your vehicle to the water with ease. 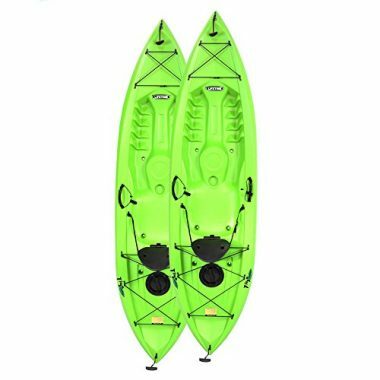 Kayak sit on top reviews for this kayak agree this kayak is exceptionally great at navigating through the water for your next adventure. The is the best sit on top tandem kayak with a banana look that will quickly spike your interest. Great for use with kids that will love the look, this color also offers added safety in the open water increasing your visibility. This Intex Explorer K2 kayak has a lightweight design making it easy to portage between lakes no matter how many people are there to help. Its low profile design makes it a great option for still water such as lakes or lazy rivers. The removable seats gives you the ability to make this kayak fit your needs, even if they are ever changing. They are incredibly comfortable, being inflatable allows them to conform to your back giving you added comfort as it conforms to your body’s shape. 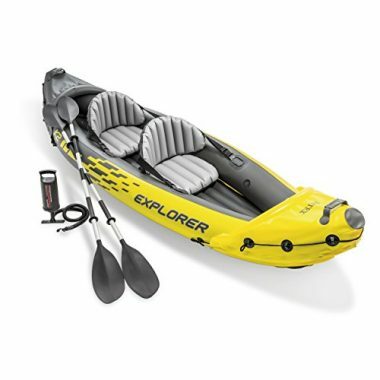 Great for individual or solo use, this kayak expertly moves through the water with ease. The low profile design makes it incredibly stable and thus great for use with beginners. 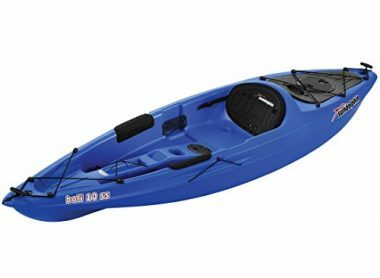 This kayak is under 300 and even under 100 which is great for beginners as it has a removable skeg, similar to a fin, that helps you maintain direction and maneuver your kayak with ease. This is the best sit on top fishing kayak is perfect for long trips out into the wilderness. The storage capacity makes it the perfect kayak for bringing lots of fishing gear or packing up your camping equipment. You could even bring both and become self-sufficient for a few days. The Gear Tac system also allows you to customize your kayak and add what you need to get you going. You can attach several accessories, including rod holders or electronics. The comfort carry handles make carrying this kayak a breeze. You can easily get it on top of your vehicle for transporting to mountain lakes, and when you get there, you can easily move the kayak about. There is also a skid plate added to the hull (where there is extra storage) to add some durability to the kayak. This is a kayak you will want to take on an adventure. This is the best sit on top lightweight kayak that is great for still water. Take it with you for a day on the lake or down a lazy river for a new and fun experience. The coast guard has approved this incredibly durable board that rides similar to a rigid board providing the stability you are looking for. This Lifetime Tioga 120 Sit-On-Top kayak is also UV resistant which will give you peace of mind that despite long term use, it will stand the test of time. With durable welded material you don’t have to worry about the integrity of this kayak. The welded seams hold up much better than the more commonly used glue to hold the seams. The vinyl is puncture resistant which is sure to give you peace of mind. A comfortable backrest that is also inflatable makes it so that the seat expertly forms to your back giving you an increasingly comfortable experience. A spacious cockpit will allow you enough room to sit comfortably for long periods of time and to bring your gear with you. The entire front of the kayak is dedicated to cargo space with a mesh top. Pop your gear into some dry bags and take to the water with enough space to hold enough stuff for your next weekend trip. Plenty of peace of mind with this purchase, it handles well in all waters. For those who love fishing, this is a great 2 person sit on top kayak. If the impressive five year manufacturer’s warranty does not get you excited, the fact that it has 3 fishing pole holders will. 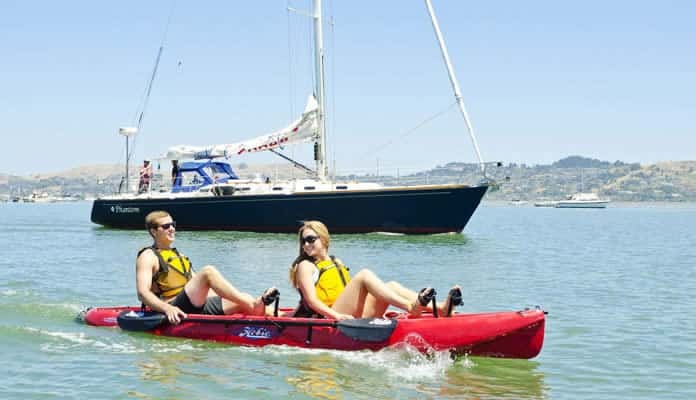 With a comfortable padded backrest, this tandem kayak will keep you and your friend comfortable for long quiet days on the water. Coming with many different heights of foot rests, it doesn’t matter your height, you will be comfortable in this kayak. An interior storage hatch ensures you have more than enough space to hold all your gear and even enough to bring your days catch. Don`t worry about the integrity of this rigid board as it is incredibly durable. Lifetime has thought of everything, even incorporating paddle holders on the kayak for while you are fishing. This is the best sit on top touring kayak that looks great. 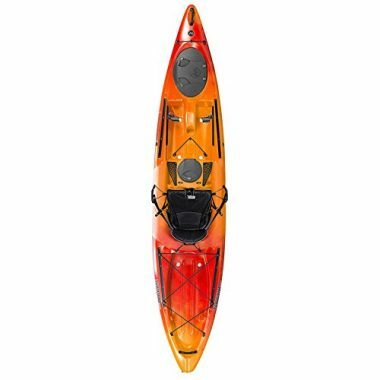 We love the rich orange and reds which adorn this kayak, and we are sure that you will too. If you do not, then there are other bright and fun colors to choose from. 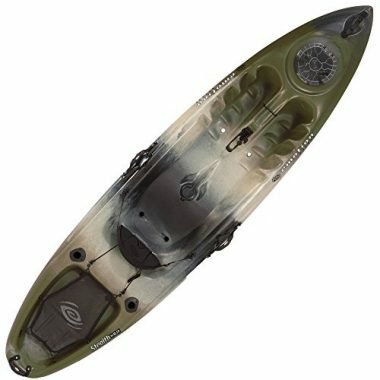 The Wilderness System Tarpon 120 fishing kayak shape and size of this kayak make it great at cutting through the water. It is not hard to get this kayak up to a good top speed, and when you are there, it is easy to maintain that speed. It is also easy to maneuver this kayak through the water. This is a great kayak if you want to get out on the water and have some fun. There is some storage for you to take some belongings with you, but the focus here is speed and maneuverability. A great kayak for people of all skill-sets. This kayak has been designed with fishing in mind. You start with five rod holders dotted around the kayak. The choice gives you the freedom to place the rod where you want it or to use multiple rods at the same time. The performance of the kayak is also something which will endear fishers to it. You will find it easy to get to the perfect fishing spot, and once you are there, you can chase fish or move the kayak without disturbing the fish in the water. The sliding foot braces allow you to find the perfect sitting position and also give you the power you need when you are tackling the large fish in the water. There are also two paddle hooks. If you are paddling through the water and need to reach for your rod, you will not run the risk of losing your paddle to get the fish you are after. If you are after a fishing kayak, then this is a great place to start. This is a great entry kayak for adults and kids. The kayak is largerr than most and a lot lighter. This makes it easy to maneuver in and out of the water, and it is light enough for kids to be able to lift and paddle in. There is ample storage for anything which you want to take with you, and you will still be able to reach great speeds with this kayak. If you want to have some relaxation, then you will also find that this kayak is very comfortable. The seat is molded and has multi-rest footrests. There is also a cup holder and paddle holders. 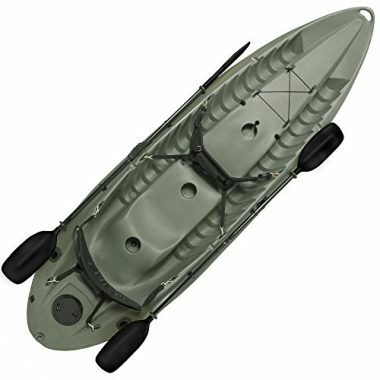 Two rod holders on the front mean that you can go out fishing in this kayak too, and the kayak provides you with a great way to get kids interested in fishing. This is a kayak which everyone will love, but we would especially recommend it to those who are looking to kayak for the first time. 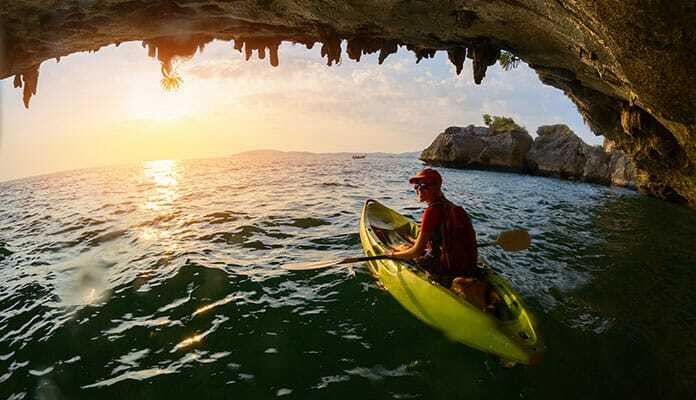 This is the best sit on top kayak for the ocean. The kayak features enough room for even the tallest person but is still light and maneuverable enough that even a child will be able to glide this vessel through the water. It does track well in the water, and you will find that you can turn it easily, even when you are hitting high speeds. You can use this kayak purely as a way to get from a to b, but it is also perfect for fishing too. The comfortable seat allows you to stay in the kayak for long periods of time. Perfect for when you are waiting for the fish to bite. There are paddle holder and also rod holders. Storage the front and the back allow you to bring all of your fishing gear with you. This is a fun kayak to use which has a lot of comfort. Take it out for a spin or use it to follow the fish. Kayaking comes in many forms ranging from inflatable to hard styles. There are also sit on top kayaks which don’t require you to slip into a covered hull but rather, just as the name describes, sit on top kayak. The best kayaks will have different features than what you would typically expect in other rideables. These are typically easier to use and often come at a more affordable price. Who Are These Site On Top Kayaks Designed For? These are perfect for people with long legs or are claustrophobic. The flat deck allows you to stretch out and even dangle your feet into the warm summer water. It is easy to see the value of a sit on top kayak that will carry for those who are very tall, or carry most of their height in their legs. Also, if you are an adventure lover this type of kayak is perfect for you. Bring your scuba gear with you to the middle of the lake, set the anchor and go take a look at the bottom. Love fishing? Bring your rod and tackle box and paddle into the reeds to catch the hiding fish. Live along the ocean shore? Use these kayaks as a boogie board and coast into shore. They can keep kids entertained for hours. You can even use these kayaks as a way to get to your houseboat. 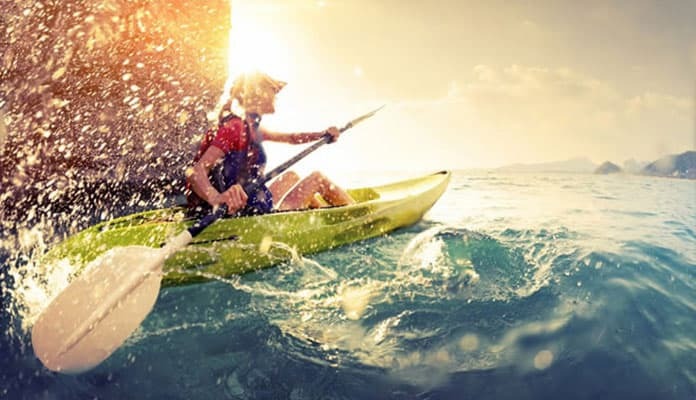 Prior to purchasing your next kayak, there are a few things you will want to consider that will help you choose the best one. What is your budget? It is ideal to have a number in mind before you begin your search. How do you plan to use your kayak? Will you be spending your time fishing, camping, or just out for an afternoon paddle? How often do you plan to take out your kayak? Is it worth buying or would renting be a stronger option? How do you plan to transport your sit on top kayak? Do you have a vehicle and does your vehicle have roof racks? How about storing it, will you need to buy a wall mount? What are some desirable features you would like your kayak to have? Fishing rod holders? Lots of storage? Maybe even extra cup holders. How many people will be kayaking? Do you need a tandem or solo kayak? Just like every kayak, there are many aspects and features you should know and understand before purchasing. Sit on top kayaks are typically made out of a durable fiberglass or plastic material. 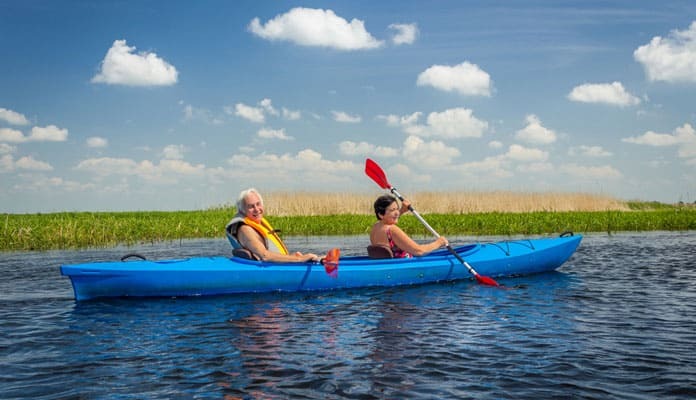 Having a wide base for your body means these are comfortable kayaks that serve many purposes. Their flat top allows you to fish, scuba dive, or even surf with ease. 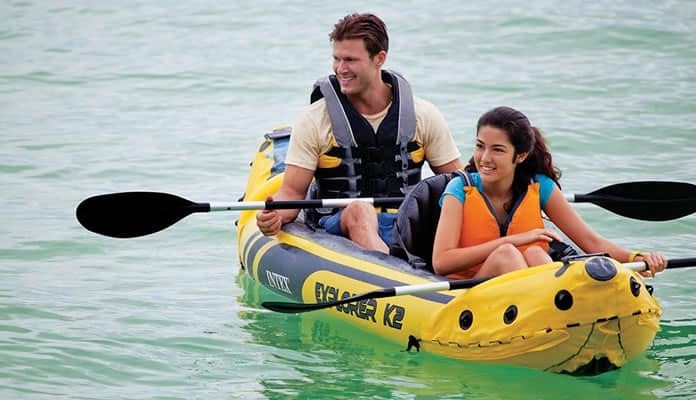 A sit on top kayak will sport a high carrying capacity also makes these ideal for larger people. It also makes it extremely easy to bring your dog or children with you. It may take a couple of minutes to get them comfortable but once they are, your pup will not want to leave. You don’t have to worry about limiting your gear for your weekend getaway as they also have ample storage space. Their short wide base makes them extra stable which beginners to this sport will appreciate. You will have the confidence to take it out into deep water from the moment you sit down on it. Some may look like flat canoes, but they perform worlds different from them. Since they have a flat top and don’t have a closed area while being practically flat they may allow more water to crest the walls. For this reason they are usually equipped with a drain plug to easily get rid of the excess water. This also makes them perfect for riding with pets and children. These kayaks don’t have a closed area and are practically flat so dogs feel comfortable sitting with you as you paddle. The open space also allows you to escape quickly if you happen to roll. You don’t need to practice escape maneuvers necessary for closed kayaks. If you do end upside down all you need to do is flip the kayak right side up and climb back on. Since these are more basic than other kayaks they are much cheaper in cost. Depending on what they are designed for and their features they can range from $100 to upwards of $800. This makes these an excellent option for a summer weekend or toy for the cabin. Some also use these kayaks as dinghies to get to their sailboat or houseboat. No matter what you use them for kayaks are exceptionally versatile and multifunctional. Q: How do you sit on top of a kayak? A: This may seem obvious, but that doesn’t mean most people get it right. The key to a kayak is balance, especially if you’re planning on taking it into the ocean where you’ll find big waves. When you first get on the kayak you will want to spread your legs as wide as possible. There will be foot holes, or a designated spot to put your feet, but if it’s not comfortable for you don’t use them. If you’re in a place you want to stay for a bit you can even dangle your feet in the water if that gives you more stability. Once you’re on your kayak you will want to find a comfortable position. You can use your arms to position your body in the center of the seat by lifting your body and shifting your weight to where it feels best. Sitting in a slightly forward position will allow you to use your core to stabilize your kayak. Your ankles should be relaxed with your knees bent around 120 degrees Once find a comfortable position you can start paddling. Q: How to paddle a sit on top kayak? A: Paddling on a kayak is different than a regular one. You will find it more tippy so you will have to use your core and legs more than in a traditional kayak. As you paddle you can use your legs to shift power through your upper body which will give you a more stable and smooth movement through the water. Q: How stable are kayaks? A: Sit on top kayaks are less stable than traditional kayaks. This is due to their shape. The flat deck makes them have a higher center of gravity versus a sit inside kayak. That doesn’t mean that they are any less useful. Kayaks are great for people who like to swim. They are easy to enter and exit the water and allow you to cool off when you want. Q: How to pack a kayak for camping? A: Most of the best sit on top kayaks have limited dry storage space. Traditional sit inside kayaks have compartments where you can store your belongings in the hull of the sit on top kayak which keeps them dry. With that being said, you will have more storage space with a kayak. Just expect your gear to get wet. You can combat this by throwing your gear into a waterproof backpack or a drybag. Most of these float in case you find yourself in rough water or accidentally flip your rig. Q: How to carry a kayak? A: Traditional kayaks are easy to move by yourself due to their shape. You can use one arm to simply lift it using the hole that you sit in. Sit on top kayaks don’t have this hole. There are special carts you can get to make getting your kayak to the water easy. If this doesn’t sound like a good solution you can get, or make, a shoulder strap that attaches to each end of your kayak. This way you can easily store the strap and carry your sit on top kayak when you find your ideal beach campsite. Q: What is the lightest sit on top kayak? 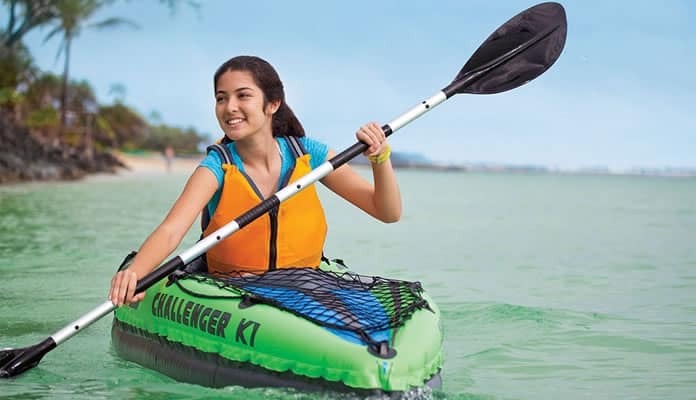 A: The Intex Challenger K1 Kayak, 1-Person Inflatable Kayak Set is the lightest kayak on our list. Weighing only 27 pounds this kayak is light enough to bring just about anywhere. The fact that is inflatable helps to make it even easier to transport. Despite the compact size of this kayak it is still quite spacious making it a superior choice. Q: What is the fastest kayak? A: There is no perfect kayak that fits this category. A good way to think about it is the thinner a kayak’s footprint in the water, the faster they will move. This is due to a decrease in drag caused by the friction of the water on the bottom of the kayak. But that being said, you will give up stability and turning ability for the speed. Keep this in mind when looking for your ideal kayak. Q: What is the best kayak for touring? 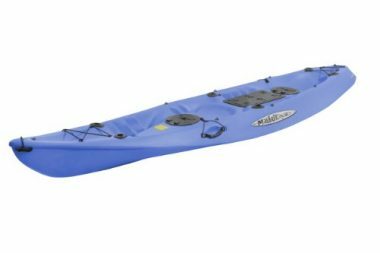 A: While all of the best sit on top kayaks will do for long distance paddles, our favorite is the Ocean Kayak Frenzy Sit-On-Top Recreational Kayak. This is due to its large and spacious design. Offering tons of storage for your gear this kayak even has a cup holder for convenient access to your favorite drink. With molded foot rests and a 4-way adjustable seat you will have no problem getting comfortable for the day. Q: What kayak is best for whitewater rafting? Having the best sit on top kayak is a fun way to enjoy a hot summer day. Take one of these to the lake and enjoy snorkeling around with this as a home base. Always wanted to go camp on an island? Use this to transport you and your gear for the perfect weekend getaway. The stable bases will instill confidence from the moment you sit on one of these kayaks. Their durable material allow you to be as hard as you want without having to worry about breaking these rigs. Sit on top kayak reviews agree that the freedom you get from the spacious designs great for longer paddles, or bigger people. With all these may be the best for you to combine the space you need with a comfortable and expert ride. Have a sit on top kayak? Let us know how you like it in the comment section below.